Book a rental car in Byron Bay with VroomVroomVroom. We compare deals from top car rental companies such as Hertz and Avis to bring you the lowest prices. Use our user-friendly comparison system to find your Byron Bay car hire. The town has a population of about 4,981 and is considered as the center of the Byron Shire -which has an excess of 28,000 residents. A Captain James Cook named Cape Byron after John Byron, a circumnavigator and the grandfather of the famous poet, Lord Byron. Cape Byron has several beaches which are popular for surfing. The area is also famous for its wildlife -where the whale watching industry plays as a significant contributor to the local economy. Why rent a car in Byron Bay with VroomVroomVroom? Great rates: We offer the cheapest price in rental cars and our Price Promise can assure you of that. Excellent service: Our helpful customer care experts are ready to help and answer any questions you may have. Contact us today! Byron Bay is a coastal town located in the northeastern corner on the state of New South Wales, Australia. It is about 772 kilometers from north of Sydney and about 165 kilometers from south of Brisbane. The headland of Cape Byron is the easternmost point of the mainland of Australia. Byron Bay is a picturesque beach side town located in northern New South Wales. It is the most eastern township of Australia and is a lovely family destination. There aren't really any public transport options, so a car rental will be your best bet. Byron Bay is an ideal day-trip destination if you're staying in the nearby cities of Brisbane or the Gold Coast. VroomVroomVroom would like to share a list of places you can visit on your next holiday in Byron Bay. The Macadamia Castle has been the area's most popular activity destination for over 40 years. The Animal Park, Mini Golf Café, Nut Bar, Fine Food section and Retail store provide a full days entertainment and education. Their keepers share their experience of our animals with close and personal talks sharing education and conservation. The Cafe serves delicious homemade meals including their best-selling pancakes. Their gift shop has an outstanding selection of items in case you want to take home some souvenirs. 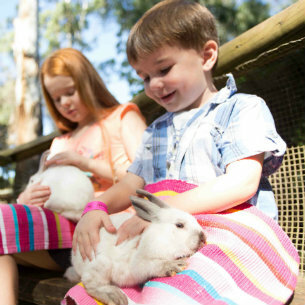 The Macadamia Castle and Animal Park is open daily from 8am to 5pm except on Christmas Day. The park is just 2 minutes from the Lennox Head Exit on the Pacific Highway. If you are coming from Byron Bay, it will take approximately 23 minutes to reach this famous attractions. Cape Byron Marine Park extends from the Brunswick River to Lennox Head. It includes the tidal waters of the Brunswick River, Belongil, and Tallow creeks. In Cape Byron Park, you'll see local marine habitats which include a variety of exposed and sheltered beaches, rocky shores, rocky reefs, submerged pinnacles, small rocky islands, coral communities, estuaries, coastal creeks, lakes, and a wider range of sandy seabed habitats. The marine life that Cape Byron Marine Park feature are different species of dolphins, seabirds, turtles, fishes, seaweeds, and invertebrates such as sponges, anemones, and corals. Endangered marine species can also be seen in the Marine Park such as terns, gray nurse sharks, and sea turtles. If you're in the right timing, you might even see Humpback whales on their annual migration. Located about 70 kilometers from Byron Bay, the Mount Waring National Park was dedicated as a National park in 1966 and was included in the World Heritage Listings in 1986. The Wollumbin National Park is 1100 meter climb. The walk takes about 5 hours but there's an alternative 500 meter stroll to a viewing platform that overlooks the magnificent rainforest. Enjoy the beautiful coasts and rainforests of Byron Bay! The Nightcap National Park is about 90 kilometers from Byron Bay. In NNP, you'll encounter 4,000 hectares of beauty. Its highlights are the Minyon Falls which has a 100-meter waterfall, mountainous bush walks and trails that have a subtropical rainforest ambiance. 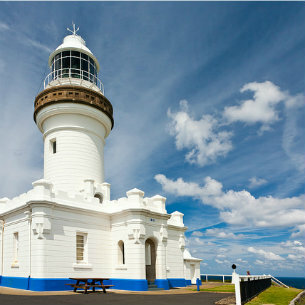 You can't visit Byron Bay without seeing the iconic lighthouse. Visit and take a stroll around the lighthouse, go for a walk all the way out to the rocky point and then head back up to the shop for a well deserved ice cream. Go for a swim in the crystal clear water after, or just laze around in the sun on the soft sand. Watch the dolphins and turtles frolicking around the bay from the top of the lookout while in your car. Gorge yourself at the famous Byron Bay Cookie Company. Pay a visit with your car rental to the Byron Farmers Market to pick up some fresh local produce. Feedback: Couldn't have been any easier to book it on my phone. Great! Feedback: Thanks! That was awesomely easy! Avis Byron Bay Apartments Inn - 20-22 Fletcher Street, Byron Bay, NSW. Hertz Byron Bay Downtown - 5 Marvell St, Byron Bay, NSW.